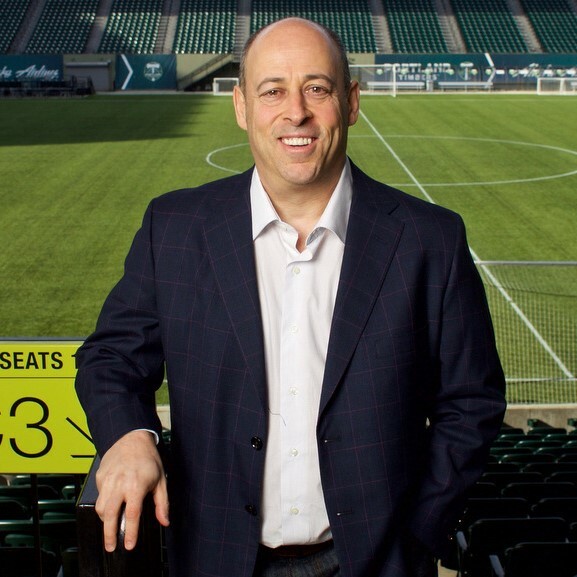 Portland Timbers President of Business Mike Golub has more than 30 years of experience in professional sports marketing and management, including a wealth of experience in Portland and the Pacific Northwest. Golub joined the Timbers in 2009 and helped lead the organization during its highly successful launch to Major League Soccer. Golub – who oversees all business functions for the Timbers, Portland Thorns FC and Portland Timbers 2 (T2) – is a two-time recipient of the Doug Hamilton MLS Executive of the Year (2011, 2013). Under Golub’s guidance, the Timbers have indelibly changed the landscape of sports in Portland, while becoming a national success story and a model professional sports franchise. The Timbers have sold out all of their regular-season games in their six MLS seasons, forged industry-leading corporate partnerships, created an Annual Member waiting list of more than 13,000 fans, introduced an award-winning community relations platform, Stand Together, created one of the best in-game stadium experiences in sports, established the Thorns as the most successful women’s soccer club in the world and cultivated the Timbers’ international reputation for overall excellence. Golub received the Doug Hamilton Executive of the Year award following the 2013 season in which the Timbers continued to see growth in key business areas, including ticket sales, corporate partnerships and local television ratings. He also received the honor in 2011 in recognition of the team’s remarkable and historic inaugural season in the league. As a club, the Timbers have been honored with numerous league and industry awards under Golub’s leadership. In 2015, the Timbers were singled out, for the second time in three years, as part of an elite group of top professional teams named as finalists for the Sports Business Journal’s “Sports Team of the Year,” a group that included Major League Baseball’s Kansas City Royals, the NHL’s Tampa Bay Lightning, the NBA’s Golden State Warriors and the NFL’s Carolina Panthers. In 2015, the Timbers were one of four professional teams nominated by ESPN for Humanitarian Team of the Year. For six consecutive years the Timbers have been named one of the Oregon’s most philanthropic businesses and, in 2015, were named by the Portland Business Journal as the state’s most philanthropic medium-sized business. Golub also brings considerable experience in a variety of major league sports. Previously, Golub served as the Chief Operating Officer for the NBA's Portland Trail Blazers from 2006-08, reshaping the team’s business and brand into one of the most successful in professional sports. With Nike, he was a founding member and director of Nike Sports Entertainment, a global sports marketing division that established new strategic alliances and created and administered Nike-owned sporting events. He served as the Executive Vice President for the NBA's Memphis Grizzlies from 2000-05 and was the Senior Vice President of Business Operations and Chief Marketing Officer for the National Hockey League’s New York Rangers prior to joining the Trail Blazers in October 2006. Golub managed the National Basketball Association’s Events Division from 1991-96 and began his career in sports as a producer for Major League Baseball Productions. Golub graduated from Dartmouth College with a B.A. in Government and earned his Masters of Business Administration from Stanford University. Golub is Chair of the Regional Arts and Culture Council, Vice Chair of the Board of Directors of the Oregon Cultural Trust and serves on the Board of Directors of the Portland Business Alliance, Pioneer Courthouse Square, Oregon Special Olympics and the Oregon Sports Authority.